University in the central province of Thua Thien-Hue on April 16. The scholarships, each valued at 150 USD, are sourced from the fund for education and social support. During the 2018-2019 academic year, the fund sponsors 9,600 USD for 32 standout students at the university. They will continue receive the support until graduating if they have good studying results. 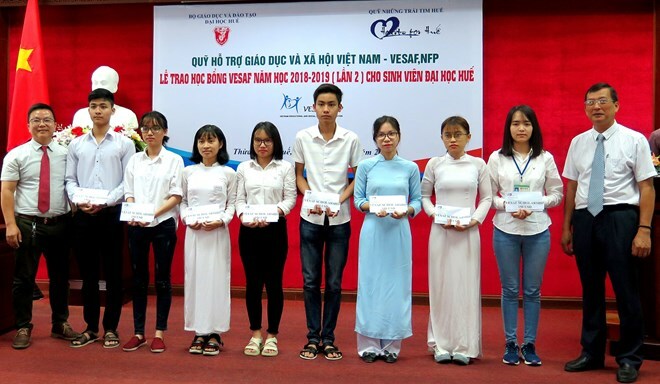 The fund has so far granted scholarships for 80 students in Thua Thien-Hue. Besides, it has carried out a credit support programme for impoverished women in Phu Vang and Quang Dien districts and Huong Tra town, with a total outstanding debt of more than 2 billion VND (86,200 USD).